I have to say I normally don't read memoirs, autobiographies or even biographies, I'm more of a YA book kind of girl, but when I was asked to read Brain On Fire and after looking up what it was about, I definitely was intrigued. From the first page of the author's notes, I was hooked. I wanted to see how this happened and the journey this young girl went through to be where she is today. 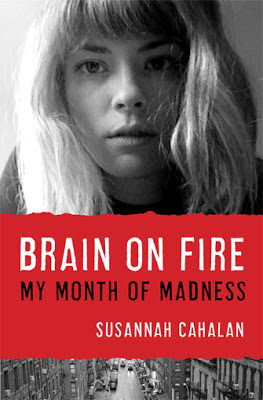 This book tells you the story of a young woman, Susannah Cahalan's point of view as well as her families, doctors and others in her life, since she still can't pin point everything that happened to her. One day she starts getting symptoms that are un-explainable, like, hallucinations, being violent, OCD, insomnia, being lethargic and it doesn't stop there. This happens to her out of nowhere and when she wakes up one day, she's in the hospital, strapped down, with no memory of what happened to her. I seriously couldn't put this book down. This is one that is definitely going on my list of books to share with friends and family, especially with those in my life I know who suffers with any type of mental illness. What kept me turning the pages on this book was the raw honesty and how the author doesn't sugar coat anything, she tells you from the get go that even her sources aren't reliable since she doesn't remember much from that point in her life. This book will definitely open your eyes, make you think and seriously feel for what she goes through. This was one of the best reads I've had in a long time and I'm really glad to have had the opportunity to read it. Disclosure: All opinions are my own. I received Brain on Fire at no cost for the purpose of this review. No other compensation was received.